I think this is the best fried squid recipe I found. Try this one and you will surely love the calamares fritos. One thing I noticed about this recipe is how savory the breaded fried squid ring is and how good the breading sticks to the squid. Unlike other method of cooking breaded squid rings that usually the breading falls off, the method of dipping the squid in the flour mixture then dipping it in egg wash make the squid ring crispy breading outside and tender squid meat inside. The making of egg wash is another good technique compared to using just beaten eggs only. If you will only use beaten eggs as coating for the breading, it will burn easily when you fry it. But the egg wash, a mixture of beaten eggs, calamansi juice, oil and water will definitely make your fried calamares the best fried calamares you’ve ever tasted. I think this is the best fried squid recipe I found. Try this one and you will surely love the calamares fritos. Slice squid into ½ inch rings. Marinate for ½ hour in 1 tablespoon of the calamansi juice and sea salt. Drain In a bowl, combine cornstarch, flour, salt and baking soda. In another bowl, blend water, the remaining calamansi juice, egg and oil. Dip squid rings into flour mixture, then into egg mixture, and deep fry until golden brown. Serve hot with sweet chili sauce or vinegar with garlic. Wow! 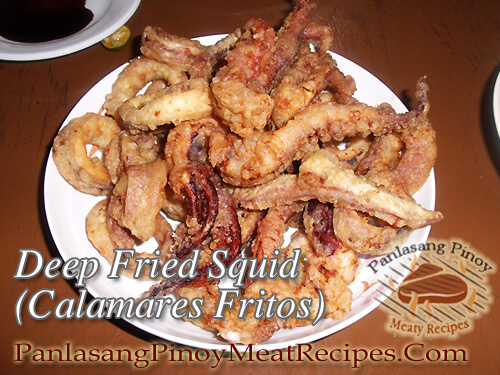 I tried this delicious calamares recipe and I love it! Thanks! Hi Julia, I’m happy to know that! Cheers!